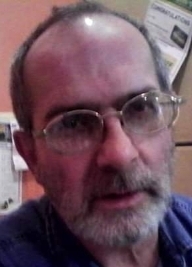 OTTAWA – David D. Wehri, 59 of Ottawa died 5:50 p.m., Tuesday, April 9, 2019 at his brother’s residence. He was born December 31, 1959 in Lima to the late Wendelin and Alma Jean (Moore) Wehri. Survivors include three siblings: Janet Treadway of Columbus Grove, Dale (Kristy Parker) Wehri of Ottawa and Brenda (Rick) Lindeman of Vaughnsville; and several nieces and nephews and great nieces and nephews. He was also preceded in death by two siblings: Steve Wehri and Ruth Krontz. David had worked at Philips, PSI and RKI. He enjoyed fishing, woodworking, playing chess and busying himself with multiple projects. David was great at telling jokes. Funeral service will begin at 3:00 p.m. Saturday, April 13, 2019 at Love Funeral Home, Ottawa. Visitation will be from 1:00 p.m. until the time of service Saturday at the funeral home.